So, it took longer than I thought to return to "Portable Naval Wargame - Predreadnought" But I finally managed to play it today, RAW, in a compiled format of rules from both the Ironclads and the Predreadnought set. This took a couple of drafts, and there was still a typo in it, but that didn't affect play. So the below is the rules - using hexes - of PNW as Bob Cordery intends. Ships with 8" guns I gave a 6 dice / 5-hex range battery, and those with 5-6" guns a 4 / 4 battery. Hull was about 1 Flotation Point for each 500 tons. If a ship was equipped with torpedoes, I gave them one torpedo attack for the game. Speed was about one hex per 6-7 knots. There were pretty clean breaks in speed, i.e. several ships in the 11-14 knot range, and several in the 18-21 knot range, so this was easiest to convert into relative values. It is worth noting that the Spanish have more ships, that the Gunnery and Flotation points are nearly identical, the torpedo advantage lies with the Spanish but the speed / ramming edge is clearly with the Americans, with most ships having a 3-hex speed and a ram, while the Spanish have a 2-hex speed and only one ram in the fleet. For the scenario, I changed the history a bit and had the ES poised to stop the US as they enter Manila Bay. The harbor defenses consist of two land batteries with a 3 / 3 gun battery, and 3 real mine counters and 3 dummy counters, numbered 1-6. 1, 2 and 3 are all real and attack a ship entering the hex with 1, 2, or 3 dice based upon the density of the minefield. Below, the mines are placed by me without knowing which are the real mines. This adds a little suspense for me. I concentrate them in the center where the land batteries are weakest, each only putting 1 dice of shooting into the center of the channel, and 2 dice into the hexes next to the fort. This leaves the US with the choice of taking more Gun shots, or risking more mines, which I felt added a balanced tension for decisions. Each battery [above] has 3 / 3 gun points, so 3 dice and 2-hex range. They can both fire one dice into the center of the channel, and 2 dice into the near hex, giving even coverage across the channel. This coverage seems realistic. The below is the battlesea [as in battlefield] for the game. The harbor entrance has one squadron of Spanish ships to East and one to South, the East having the larger ships and the South the smaller ones. 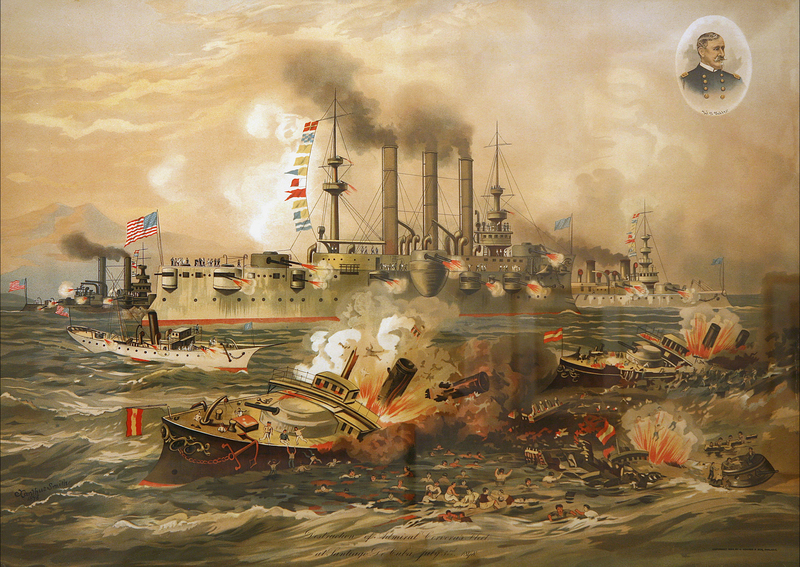 To somewhat compensate for the mines and batteries, each Spanish squadron has a delay of 1, 2, or 3 turns to get up enough steam to sail, reflecting the surprise of the US attack. I used 3 chits numbered 1-3 and randomly picked two and placed one with each squadron. They will be flipped immediately after the first shot or mine explosion, as the Spanish go to battle stations. Below, South squadron of three Velasco Class unprotected cruisers and a gunboat. Below, squadron of two large unprotected cruisers and two small protected cruisers. Turn 1 movement. There is no gunnery so US enters the board. No ship reaches a mine. I'm planning to send Olympia, center, to whichever side has no mines, or the fewest. Turn 2, Gunnery. Shore batteries each put 2 Hits on a ship rolling a '6' each and causing Petrel to need to depart the fight [how, I've no idea]. In return, the US Armored Cruisers pound the batteries with three hits each [white dice], enough to suppress them. They will get back one Gunnery Point a turn for three turns if not fired upon again. This is to reflect that it is hard to destroy a stone and earth 'ship' from below! But you can make it hard for them to man the guns while under fire. Turn 2 Movement has the small US ships take the lead through the minefield. And, as fate would have it, ALL the mines are only in the center channel! This is just typical of my luck with this naval war...the luck is almost always against the ES and with the US. One awkward aspect of the rules is revealed...as you must move forward one hex before you turn, the Olympia can't turn and avoid the minefield. I put her in the top of the channel instead of messing around with the turning rules. Turn 3 has no gunnery needed as the forts are suppressed. We head directly to movement, and the ES have a delay of 1 turn for the South squadron, and 3 for the North Squadron. The US therefore moves into the harbor and heads South to destroy the small squadron first. As always seems to happen, I forget to turn over the dice, so now all the turns are off by one! *long, drawn-out sigh* So, add one to every turn from now on! Turn 4 movement. The ES South squadron is free to move and closes in to use torpedoes and hopefully make an impact before getting wiped out. The US also advances, getting their formation broken up a bit due to having to pay for turns. Doesn't seem correct, really. 5 Gunnery. ES has torpedo attacks [3 dice to left of ship] which of course roll amazingly well, while their gunnery is limited to only 1 dice, altho Don Antonio gets a lucky hit. This results in the Concord sinking. In return, the US lays down 3 Hits of gunnery and 3 Hits from a torpedo attack by the Raleigh. Turn 5, more US gunnery. The bigger US ships are bringing up the rear. Their 8-inch guns pound 5 more Hits in, sinking both the Velasco and the Don Juan and leaving the Don Antonio in poor shape. Turn 5 Movement has both squadrons closing in as there's little room to maneuver between the shore line and the US squadron. Turn 6 Gunnery. ES ships are clearly shaken...they miss. US pounds home four more Hits, and both ES ships sink, leaving the squadron a rescue effort rather than a threat. Turn 6 Movement. The US starts to change course so as to engage the North ES squadron. The Boston, with its slow speed, is forced to venture towards them on its own and await the rest of the US ships to catch up. Worth noting is that a ship with Move 2 can only move 1 Hex forward and turn...a 3-Hex move is significantly better as you can move 1-2 hexes forward and turn, or move 1, turn, move 1. As for the 1-hex move...it's move OR turn. Turn 7, Movement. With no gunnery, the Petrel continues its painful move off board, while the Squadrons close in on each other. I find the turn rules awkward, but not impossible. Turn 8 Gunnery. Boston may be slow, but she's deadly - 2 Hits sinks the Reina Cristina who misses in response. Note the Spanish fleet line spreading out due to a turn. Turn 8 Moves. Both fleets close in, the Spanish hope to tackle the Boston before help arrives. Boston may be able to take care of them with a little luck. Turn 9 Gunnery. Boston fires a long shot...and of course Hits for 2! Turn 9 Moves. ES lose initiative, manage to reform line. US moves Boston to intercept, intending to follow Boston in Line Ahead. However, due to a turn, Raleigh needs to slow down to 2-hexes so the two AC can keep up. It probably doesn't matter as Raleigh is a pretty solid ship and could leave the other two behind and support Boston. Turn 10 Gunnery. Boston "unleashes hell" and rolls 5 Hits on Castilla! However, the ES beat their luck and not only shoot for 4 Hits, but unleash ES cruise missile torpedoes for 2 more! Needless to say, Boston and Castilla sink. Turn 11 Gunnery. For a change, the US misses, and the ES hits for 3 - Viva Espagna!! Turn 11 Movement. The US is not afraid to close the range, having the more powerful guns and only lightly damaged ships. Still, the Spanish will go down fighting! Turn 12 Movement, Turn 13 Gunnery. ES win Initiative, get to counter-move to the US Armored Cruisers. They will not be in ideal position either way, so elect to move farther ahead. Of course, it doesn't matter and the Isla de Cuba whiffs then is blown to kingdom come by the same sharpshooter on the Baltimore - 5 Hits inflicted! The rules worked OK for "simple", but I feel they are actually a bit too simple, and that with just a few design changes will be easier and give better feel for naval combat. Pondering the Move / Turn system. Ships must move forward one hex and can then make one turn of one hex side. Let's explore some of the consequences of this mechanic. - Petral has Move 2, and can advance 2 hexes. But if she does, she has to move into the minefield as you can't turn until you have moved forward one hex. Not very appealing for a crippled ship! She can then move forward one hex next turn, and make a turn to the left, which costs one point of movement anyway. This is pretty awkward as it means you have to stop at least one hex ahead of any obstacle requiring a course change. This could of course be justified by saying that these ships don't turn on a dime. HOWEVER, with no time / distance scale, it really isn't possible to compute if this is reasonable or not. Move / Turn system, squadron in Line Ahead [following a lead ship in column]. The US squadron is in Line Ahead, and all three ships have Move 3. If Raleigh in front moves the full 3 hexes, she leaves behind Baltimore and Olympia who have to pay for a turn and can therefore only move 2 total hexes - there's now a gap in the Line Ahead formation. The solution is that Raleigh has to move forward only 2 hexes, so that the other two ships can make their turn and keep up. Net effect is that a 60 degree turn costs 33% of Move. Ok, so there's the problem - what might be the solution to this and the awkward zig-zagging of fire arcs? Hexe facing variant - face ships to the spine, not the flat. Can execute a small turn for free as it can move into *either* front hex. This also solves the problem of not being able to head straight across the board in the 3 or 9 o'clock direction below [you have to face 60 up, move, turn, move, turn, move, turn, etc, so it effectively costs twice as much to move straight in 2 of the 4 directions [board East-West]. This also makes the fire arcs easier to figure out. Pencils show how the front arc is straight down the spines, rear same off the stern, while the broadsides are cleanly along the spine line to each side. Below, using spine facing, a squadron in Line Ahead executes a gentle turn around an obstacle [yellow dice]. Boston moves two hexes with gentle turn to left. Next turn, she moves one hex and pays one move point for 60-degree turn to next spine to left. Or, she could remain facing the same direction and just keep gently angling in either front direction. A guide to translate ship stats into the game from Wiki, Janes, etc is needed. The -1 dice / hex for gunnery means that ships actually have a max range of 1 hex less than rules state, i.e. a ship with a listed 6-hex range actually has a 5-hex range. This leaves you with the more awkward rule of "-1 dice for every hex past 1" so as to have a 6-hex range with a 6 / 6 battery. Or you can live with the 1-hex range discrepency. Paying a hex of movement to turn one hex side is awkward. The net effect is that it slows a line ahead [column] down by 33-50% depending on their Move rate which seems extreme. In a chase you'd never want to change direction, even to farther away from the enemy fleet chasing you as you'd lose "ground". Restricting turns to one side after one hex forward of movement slows the game down quite a bit and makes it feel less "fluid", no pun intended. I see the goal, but I say ditch the turning cost and restriction - they don't make sense in the scale of the game, making it feel a lot more like 1800 than 1880. Torpedoes are way too good. They should have only a small chance to hit [say, a natural '6'] but if they do they cause 2 FP damage. The ability to shoot at any target, not just the nearest, results in a "shoot until it sinks" gunnery mechanism which is not realistic. Target acquisition was a major crew proficiency and gear test and was not easily done. Rather, it took a little while to range in and THEN you let fly with the whole broadside - game doesn't really reflect this. The hex mechanism doesn't really save much time and effort. True, you don't need to use measuring devices, but the fire arcs are actually a zig-zag pattern that is hard to follow - facing ships along the spine would solve that. It would also help with the turning issue - you could still charge a move point for a large turn, but gentle turns in any map board / hex alignment direction are all possible or you can move straight in any direction. I'm trying to figure out why ships should move at all in game terms. Scenario victory conditions and differences in gun ranges may force it. But if both sides are content with range, all ships could just not move at all. Perhaps one should get a bonus shooting at a ship that doesn't move? Overall, I think these are an interesting set of mechanics. I feel that they err on the side of TOO simple, and that just a little bit more would both clean them up and give better naval feel. The hexes don't help much, I think it'd be easier just to use a Grid and allow ships to face either a spine or an edge [so 8 total directions]. However, it is almost as easy and feels more realistic to not bother with any sort of grid or hex at all - there's plenty of turn mechanics and gadgets to use that are simple and players pick up quickly, even if newbies. In any event, Bob Cordery has given us a lot to think about for free, so "thanks Bob!" "Because my land, sea, and air Portable Wargame rules were designed to work together, facing the edge rather than the corner of the grid area has been used in the naval rules. The penalty of the loss of movement for turning was included to reflect the loss of speed ships suffer as they turn. It may be too big a penalty, but that is the reasoning behind the rule. Please feel free to ignore it; my rules are designed to be flexible in order for users to adapt them to their own requirements. If squadrons of ships are in line ahead on parallel courses and firing at each other, there is no reason why you could not 'borrow' the artillery rules from THE PORTABLE WARGAME rules where firing at the same target turn after turn has a +1 bonus on the firing dice. I haven't tried it myself, but it would be an interesting idea to try out. Hope that gives us all some more to think about as we tinker with the rules.